Sharing tales of the weird and strange that lurk in the shadows of Fresno and the greater San Joaquin Valley area. Being President's Day weekend and needing to get out of Fresno for a bit, and also to celebrate a late Valentine's Day with my girlfriend, we decided to head to Monterrey for the day and go to one of our favorite places there called The Crown and Anchor to celebrate. Don't get me wrong the place is fantastic, but I can't justify driving two and a half hours there and back just for some food so I began to search for something to do besides the typical “go to the aquarium and Cannery Row” trip. While searching for haunted places I haven’t been to yet (because that’s how I am) I came across Point Pinos Lighthouse in nearby Pacific Grove. Perfect. My girlfriend has a love for lighthouses and we hadn’t been to that one yet. So we had a plan. Leaving on a dreary and rainy Saturday (perfect lighthouse visiting weather if you ask me), we made it to Pacific Grove a little past 1:00 pm. There rain had stopped but it was still cloudy and the surf below was active with rather large waves, indicative of the next storm that was coming. We walked up to the light house marveling at the view it had. The lighthouse itself was small but cozy. And I soon found out it was still in operation and was the oldest operating lighthouse on the Pacific Cost. Walking inside we were met by a pleasant docent and she began to tell us the history of the place. Built between 1853-1854 the Point Pinos Lighthouse was one of eight commissioned by Congress to be built on the West Coast. Charles Layton was the first keeper and arrived with his wife Charlotte, and family in 1854 and watched over the house until the lens for the lighthouse was installed and lit on February 1, 1855. Sadly his tenure as keeper would last less than a year. While part of a posse searching for local outlaw Anastasio Garcia, Charles was shot in the stomach and a few days later he succumbed to his wounds. Without a lighthouse keeper, the people of Monterey suggested that Charlotte be made keeper as she was familiar with the upkeep of the lighthouse, plus she had her children who she needed to take care of. In the first part of 1856 she was appointed keeper of the lighthouse and became the first woman keeper on the west coast. Charlotte wasn’t the only female keeper in the history of the lighthouse. In 1893 Emily Fish became its keeper. She was recently widowed and her son-in-law was able to get her the position at the lighthouse. For over twenty years she took care of the lighthouse and added to its grounds by bringing in soil so she could add landscaping such as trees, hedges and bushes, and grass to its sandy locale. It was said the 92 acre station had cows, horses, and chickens roaming it by the time she was done. Finally in 1914, and her health failing, Emily had to retire as keeper, ending one of the longest tenures there. Over the years Point Pinos Lighthouse had thirteen keepers from 1855 until 1964 when the US Coast Guard took over. Today the city owns the property with the Coast Guard tasked with upkeep of the light itself. Everything is automated but it seems that some of the former keepers still like to tend to things there. Charles Layton’s ghost has been said to have been seen wandering the area where the light is kept on the third floor, tending the light or polishing the windows of the copula as well as doors seemingly open and close on their own. Emily Fish is also said to haunt the lighthouse and it seems she is seen more throughout the house. She has been spotted wandering the second floor of the house, specifically where her bedroom used to be as items wind up missing or are misplaced. Others have heard the swishing of skirts going by them as they catch a scent of the perfume Emily would wear. As I mentioned I had discovered that the lighthouse was rumored to be haunted by both Charles and Emily. After exploring for a bit I found one of the docents and asked if there was any truth to this. Figuring I would get the reaction I get here at home of “There are no ghosts here, please stop asking.” I was a bit surprised at her reaction. She said she hadn’t seen anything or heard of anything but admitted that she didn’t believe in ghosts anyways and that if there was something there she wouldn’t see it. Still we talked for a good fifteen minutes about Emily and all the things she had done for the lighthouse when I heard a grumbling sound. No it wasn’t a ghost, it was my stomach telling me it was time to go eat lunch. I thanked the docent for the talk and she said that one of the other docents would know more but was out to lunch and I should stop back by some time. After a quick stop to the gift shop where I picked up two new ghost books on Monterey, my girlfriend and I headed to the Crown and Anchor for lunch. Which I recommend to anyone who visits Monterey, the food is fantastic and the atmosphere fun. And try the sticky toffee pudding. It’s life changing. Is the Point Pinos Lighthouse haunted? It’s hard to say. I was there for maybe an hour and talked to one person who worked there. She was surprised by the stories but they had to have come from somewhere. The author who wrote the two local books I bought didn’t mention the lighthouse in either, but I still plan on contacting him. Perhaps when he wrote the books he wasn’t aware of the stories. I really wish I had a chance to talk to the docent that was out to lunch and see what she thought and knew. I guess that warrants a second trip back to Monterey. And not just for sticky toffee pudding. I took more photos but didn't want to post them all here so I saved them to this album if anyone wants to see. Ten years ago today I started something new. At that time Facebook wasn't the juggernaut it is today and Twitter was just taking off. Myspace still reined the interwebs and it seemed everyone and their mother had a blog, and Fresno was no exception. Inspired by the numerous blogs that were popping up I decided to create one about one of my biggest passions. The paranormal. I didn't really know how to write then (some say I still don't) nor did I know how to research and my main source of any legend was the internet. Still I had something no one else did and little did I know how big it would get. So in honor of ten years of crazy weird things I wanted to revisit my first story. The Watts Valley Wolf Ape. Before I get into the main sighting, and were the creature got it's name, a brief history of the legend of the creature is in order. There are legends of the creature coming over the Bearing Straight when the first Native Americans migrated to this land and even coexisted with them and cave drawings that were found depicted a strange creature with long grey hair with an ape like face and human-like hands and feet. It also seemed to be always sick looking, coughing and foaming at the mouth for some reason. Legend calls it the Devil Ape or Devil Fang but with the last recorded sighting it started being called the Watts Valley Wolf Ape, named after where it was seen. The first known sighting in the twentieth century was by the legendary photographer Ansel Adams. He was visiting Yosemite and while camping a pack of the creatures came upon his tent. Alone and terrified he stayed until they finally went away. Another, more terrifying story involves a lone creature entering a single room school house in the southern part of the valley (rumored to be near Hanford) and began harassing the students and teacher. To protect themselves the students piled up their desks and climbed to the safety of the rafters. The teacher was able to lock themselves safely in a nearby closet. Apparently the creature had smelled the children's lunches and tore through the desks to get them. When it finally had it's fill, it left. One of my favorite stories tells the tale of a local preacher that shot one of the creatures some time in the 1950's claiming it to be a "pet of Satan". He hung it up on the church walls. For several weeks it hung until the smell became too much. The preacher was able to sell it to a traveling circus. Here's the creepy part. With the money he made he went up to San Francisco dreaming of starting his own church up there. Sadly his dreams were not meant to be and he was murdered soon after arriving. His body was so badly disfigured that it took months to identify him. People whispered he was cursed for killing the creature. Not much more was seen of the creature. A long haired creature was seen at Bass Lake in the 1990's. This could have been a bigfoot sighting (which is no less incredible) but the creature was said to walk on all fours, which was one of it's main characteristics. So I have to say that I heard this story on the radio (RIP KRZR 103.7) and was unable to find out who the witness was. I was able to write down most of the story and reconstruct it. I fixed the structure of the story so it reads better but it still is the same. The most recent and detailed story was recanted on a local Fresno radio station. There were two witnesses, a man and his uncle, who were hunting for garnets near Watts Valley Cemetery when a strange looking creature came out of the bushes. The creature was described as six foot long, grey mangy hair and dog like with a face like a baboon and with eyes that were flat on its face like a human’s. It opened its mouth but only a moan escaped and then made a strange sound like a cough. Both witnesses began to run from the creature as it began to chase after them. For some reason the man threw his lunch at the creature but this only stopped it momentarily. It continued to chase them over the hills and the two witnesses jumped over fence after fence and ran through pastures trying to escape the creature. Cows fled as it chased the two men. Finally they found themselves in the Watts Valley Cemetery and hid behind several tombstones, hoping to lose the beast. Unfortunately it caught their scent and started to come towards them when, in a moment of genius, the uncle threw some cinnamon flavored chewing gum near the beast hoping the scent would distract it. It worked and the beast was momentarily occupied. Soon after that a caretaker for the small cemetery arrived and offered to give the two men a ride back to their car several miles away. All three watched the strange creature for a few more minutes in the safety of the caretaker’s truck before it went away. The question remains, even after ten years, is what was this? Crazed dog, bigfoot, werewolf, or some freak genetic experiment run amok have all been theorized. I wish I knew. If the story is true then whatever they saw was terrifying. But I have to ask this: why haven't there been any more sightings since? If the history of the creature has even a kernel of truth to it you think there would have been more sighting since. I've never been to Watts Valley, though I do know the area. Part of me wants to take a trip up there one weekend and visit. I just have to make sure I bring some cinnamon gum to protect myself. So that was my first story, pretty much how I originally told it. Just fixed up the grammar and structure a bit to let it read better. I can't believe I've been doing this for ten years now. 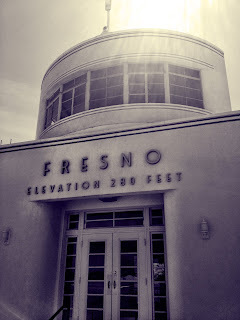 I've wrote about everything from crazy things at Lost Lake, giant catfish at Millerton, UFO sightings all over Fresno, to ghosts haunting some of Fresno's most historic locations. Not sure what the next ten years will be but I can't wait to see what it will be. Thank you to everyone who has read one of my stories over the years. It truly means a lot. The fossilized skeleton of a pterosaur. A living specimen was said to have been seen flying over the Fresno area. Image courtesy of Flickr. I’ve written about large winged creatures flying over the Fresno area in the past and most were described as large birds with near fifteen foot wingspans but while researching another something else I came across the story of Scott Norman, who in 2007, saw a creature flying in the Fresno area describing it as akin to looking like a flying dinosaur called a pterosaur. Now Scott’s sighting wasn’t random. He had been informed of strange sightings in the area and during the summer of 2007 he came here to investigate for himself. He was a seasoned investigator by this point, traveling around the world investigating different cryptid claims. His sighting occurred about 2:00 am in the morning in a local rancher’s field. He saw a large winged creature over one of the rancher’s buildings and out into the nearby field. The description of the creature was it had a wingspan of almost ten feet, was completely featherless with wings like that of a bat, and had a crest shaped object on its head roughly two feet long. The creature glided silently overhead and the entire sighting lasted no longer than 20 seconds the most. Ever the seasoned investigator, Scott was skeptical and wasn’t completely sure what he saw was indeed a pterosaur. What interests me about this story is that this isn’t the first time a creature like this was seen in the area. Back in 1891 two creatures described as “dragons” were seen flying over the Selma area. The creatures were chased for two days but unfortunately were never captured. Could these same creatures have some relation to what Scott saw over a century later? Unfortunately this was the last time Scott was able to investigate these sightings as he passed away in February 2008. This is another reason why I wanted to share his story. He did a lot in his short time on this earth and I wanted to make sure others knew what he did. You can find the original article that talks about Scott’s sighting in Fresno here and a brief description of the 1891 sighting here. There is a story of a wandering phantom that is seen along the country roads outside of Madera. The location isn’t exact but most accounts have seen the spirit somewhere in between Ave 15 and Ave 18 1/2. The first recorded sighting happened in January of 2010 when a witness and her husband were driving home to Clovis from Madera on Avenue 15. They were driving down the country road when the witness suddenly saw a man walking down the middle of the road and had to quickly swerve to avoid hitting him. The man seemed oblivious to almost being hit despite the fact that the car was going almost 60 miles per hour. The witness described the figure as Caucasian, in his early twenties, wearing a dark sweatshirt with a hood and blue jeans. After they passed him they hit a thick patch of fog and the man was nowhere to be seen. The witness notes that her husband didn’t see the man at all despite looking in the same direction as she and he was surprised by her sudden swerving of the car. Ever since that night the witness has refused to drive down that stretch of road when going home. An incident occurred late winter of 2013, this time on Avenue 18. This witness was driving home around 3:00 am and it was somewhat foggy. They were driving down the road when out of nowhere a man wearing blue jeans and a hoodie was seen in the middle of the road. The witness swerved to avoid him and noticed that he didn’t even try to get out of the way, which she thought was odd. When this occurred they didn’t think much of it as they never saw anyone on that road before that late at night. It was only upon hearing that other people had seen the same figure in the area that they thought this wasn’t a normal person. Another account involves two witnesses who were driving down Avenue 18 1/2 around 1:30am. As they were passing a church a young male, Caucasian and wearing blue jeans and a hoodie suddenly appeared about five feet in front of them. He was standing on the dividing line of the road and the driver missed him by inches as they swerved to avoid him. Despite being so close to him they were unable to see his face. As they drove past him, she looked back and he was no longer there. There are more accounts like this with the same description of the man, late teens to early twenties, Caucasian and wearing blue jeans and a hooded sweatshirt. Some witnesses have also said he was wearing white tennis shoes, but this varies. Another common theme is how the man is oblivious to the oncoming car and is described usually as looking down. Also most of the incidents happened late at night and it seems all the witnesses are females. So here’s the question. Who is he? Conjecture (which I’m great at) has me wondering if some young man was walking down one of these roads late one night and wasn’t paying attention (like he was looking down) and didn’t see the oncoming car and was hit and killed. Perhaps the person who hit him was a woman and this is why he seems to only appear to them. It’s hard to say without researching more, which I will be doing. But it does seem that some poor soul is doomed to wander the country roads outside of Madera. Is Sanger's Brehler Square Park haunted? Brehler Square Park in Sanger, California. Image courtesy of Google Street View. While researching something in the area I came across a story that mentioned that the Brehler Square Park in downtown Sanger is rumored to be haunted by the spirits of local Native Americans. Curious to see if this was more than urban legend I started to dig around. The park was once the location of the Brehler Building which was built sometime during the turn of the Twentieth Century and housed several business included a bank, a post office, a bakery, the local newspaper, and a general store and pharmacy that was ran by the building's owner Oscar Brehler. 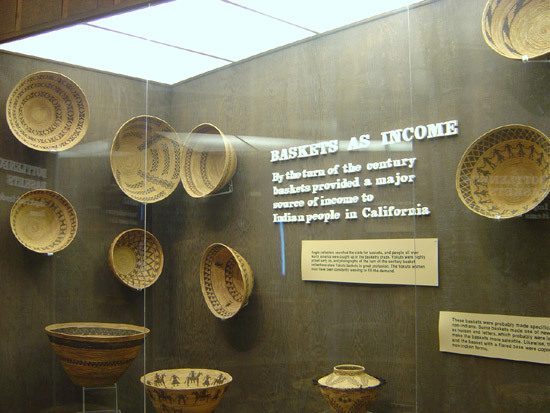 Mr. Brehler would often trade with some of the local Yokut tribes, trading them either supplies or outright buying the baskets the tribe was known for. Over the years he developed quite a collection which can now be seen at the Sanger Depot Museum a few miles away. The collection is quite extensive and is considered one of the best in the country. 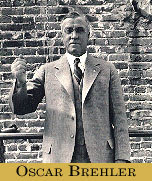 Image courtesy of the Sanger Depot Museum. The building itself was torn down in the late 80's and the area was turned into a park. Witnesses have heard drums and chanting and one even said they saw a figure in the trees one night while walking their dog. Upon getting closer they found the park empty with no one around. 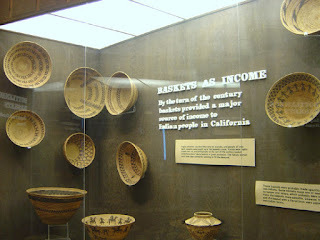 Some of the baskets that Oscar bought over the years. Could these be the spirits of the Native Americans that traded their goods over a century ago and now they want them back? But if that was the case wouldn't the museum exhibit itself be haunted and not the park? If the park is indeed haunted perhaps the land held some significance to the local natives. Another possibility is that it is a residual haunting of those that sold their wares so long ago and for whatever reason something was imprinted on the area. Or perhaps it's just another urban legend with its genesis in facts and has morphed over time and taken on a life of its own. Whatever the case may be it seems Sanger isn't short of its ghost stories. Small Fresno County town said to have history of cult activity. 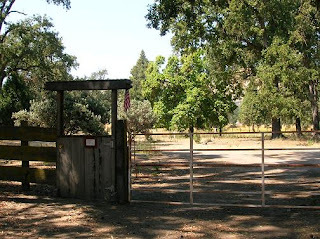 About 40 miles east of Fresno lies the small town of Dunlap. 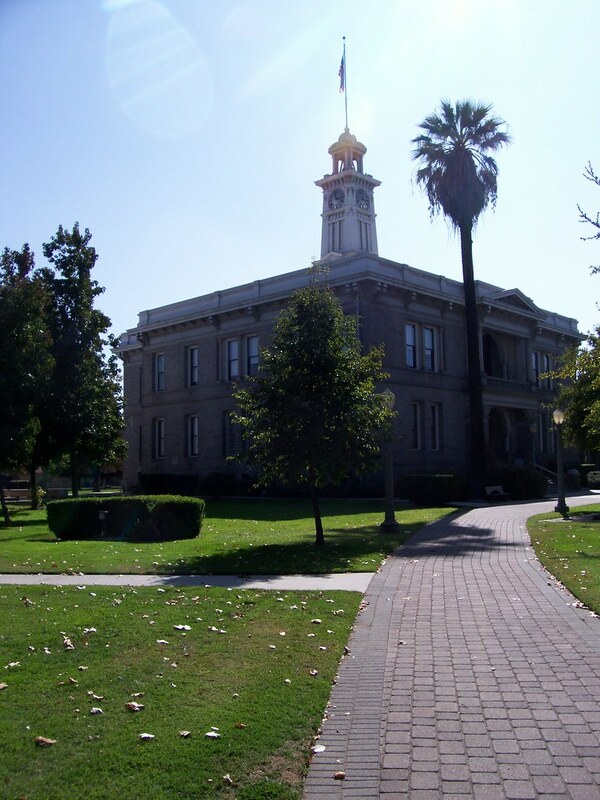 Like most towns in eastern Fresno County it got its start as a stage coach stop in the 1800's. For the most part this small town seems to be unremarkable except for rumors of occult activity during the early history of the area. Legend says that some time in the mid 1800's there was a small shack on the outskirts of the town that served as a meeting place for a local cult. It was rumored that this shack was used for dark rituals designed to conjure up demons and sinister supernatural entities. The goal of these rituals were to give the members supernatural powers to help them further their sinister goals. This went on for years until for reasons unknown the sect decided to disband and the members went on to carry normal lives. Even though no longer practicing, the group were still loyal to one another and when a member died they requested to be buried in the Dunlap Cemetery in an unmarked grave despite the fact most members no longer even lived in the area. It seems one final ritual was performed and the group conjured three tall, shadowy figures and bound them to the cemetery to protect the members buried there and seemed to be seen the most near a cluster of oak trees. People have heard whispering voices chanting "Leave us alone!" over and over. One witness decided to disobey the whispers and ventured further into the cemetery only to hear footsteps follow them despite the fact they were alone. The voices grew louder and louder until they were no longer whispers but screams in their ears. This seemed to go on for an hour until they couldn't take it anymore and fled the cemetery. Of course the skeptic in me questions this story and wants to chalk it up to nothing more than urban legend. People who live in the are vehemently denying the story and most claim to never even have heard of it. If it is indeed nothing more than fiction, what was the genesis of the story? That part has always interested me, that there was some story that seemed to have lasted the years and took on a life of it's own and became a living, breathing entity. People can dismiss it all they want, but the story still is out there. I'm not the only one to have written about it. And I doubt I'll be the last. Anyone who knows me knows that I'm obsessed with Disneyland (I have copies of the original Haunted Mansion blueprints framed and hanging on my wall). So when I saw this story making the rounds over the past few days about a strange black smoke ring seen floating over the Magic Kingdom back in May of 2015 I knew I had to investigate this. Watching the above video you can see a large black ring floating in the sky somewhere near the Finding Nemo Submarine ride (you can hear the "Mine. Mine" of the seagulls in the background). As the object floats in the air you can hear several people voice their concern and one even asks if they should ask a cast member (Disneyland employee) what it is. Finally after a minute or so black ring dissipates. Definitely interesting. It appeared to be some sort of smoke ring, but what caused it? Alien spacecraft going to light speed (maybe it was the Millennium Falcon since Disney owns that now)? Some speculate that it was some sort of wormhole to another dimension while others said it was proof of the government manipulating the weather. Curious, and a bit skeptical, I decided to dig further. And as luck would have it I found another video at Disneyland published on the same day as the previous one (May 20, 2015). It seems whatever it was, it was obvious enough to get people's attention. Both of these videos were shot at night, which had me thinking. I started digging some more and came upon another video showing the black ring, but this time in January 2016. And once again shot at night. As I was watching this other video, craving both a churro and Dolewhip, I heard the person recording the video say it was windy. And it hit me. Nighttime is when they do the firework shows and the World of Color light show (worth waiting an hour to see) in the parks. I was there in December of 2015 (as well as Oct. 2012 and May 2014) and all three times I saw World of Color and during the show they make use of fire and the pyrotechnics are arranged in a circular space. This has to be what was recorded in the above videos. Since World of Colors is in California Adventures, those in the original Disneyland park and not familiar with the show may not know what these smoke rings are from. Even if they did they still are a bit unnerving. Disneyland is known for it's immersion. There are no newspapers, radios or Tv's, or anything else that would bring the outside world in. Walt Disney wanted it that way he was so set on people being drawn into his park. So seeing a giant black smoke ring floating over the park could seem unnerving to some. Me, I'd probably not even see it as I would riding the Haunted Mansion for the 20th time. So sadly it wasn't a wormhole or Han and Chewie heading to KashyyyK for Life Day. Just the aftermath of some pyrotechnics. Like I said, I love Disneyland. But not as much as my friend Heather. Check out her website Churro Kingdom for a whole new look on the Magic Kingdom. Does a secret vampire underground society exist in Fresno?